Landowners, community stakeholders and investors have realised that no coherent spatial framework guides the future development of the Parktown Commercial Precinct. 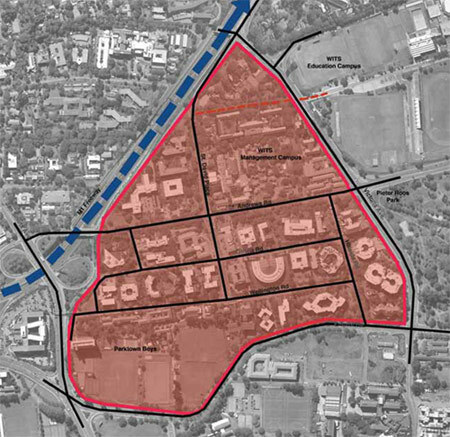 The development strategy and program for the urban renewal of the Parktown Commercial Precinct Study Area is being produced by Ludwig Hansen Architects and Urban Designers in collaboration with Paragon Architects, the Parktown and Heritage Trust Joint Planning Committee,investors, landowners groups, Parktown School for Boys and the University of the Witwatersrand. The aim is to produce a framework to guide renewal, which considers the future identity of the area, fully utilise its potential, regenerate and reuse existing buildings, expand the range of development opportunities, improve the quality of the public open spaces, maximise accessibility, improve the green infrastructure and utilise and celebrate heritage buildings to their full potential. Because the Parktown Commercial District has a number of buildings and places of heritage value it is imperative that all heritage elements should be respected. A further aim includes the possible establishment of a City Improvement District (CID) for the area. The aim is for the Urban Design and Development Framework to become the basis for discussion and eventual future formalisation of the CID. In its aim to create a coherent vision they have embarked on a programme to prepare a Spatial Development and Design Framework for the Parktown Business Precinct. The Urban Development and Design Framework Document forms an important segment towards achieving this goal.